Get familiar with your ConvertKit account. When you click on your avatar in the top right corner of the app, you'll be taken to a drop down where you can access your Account Settings. Company Name: This is the name of you or your business. This will be present at the top of your Landing Pages and in your Email Template. API Key: You will use this key to connect with various integrations, such as our Wordpress Plugin. API Secret: Some integrations (like Zapier) require your API Secret Key. This is used by any app that would unsubscribe users on your behalf. Affiliate Link: If you're a ConvertKit Affiliate, your unique Affiliate link will be available here. Subscriber Consent Options (GDPR compliance): This option will show a page to Subscribers after they opt-in, requesting them to provide consent for additional emails. This is to comply with the new data privacy regulations in the European Union. For more information read this help article. 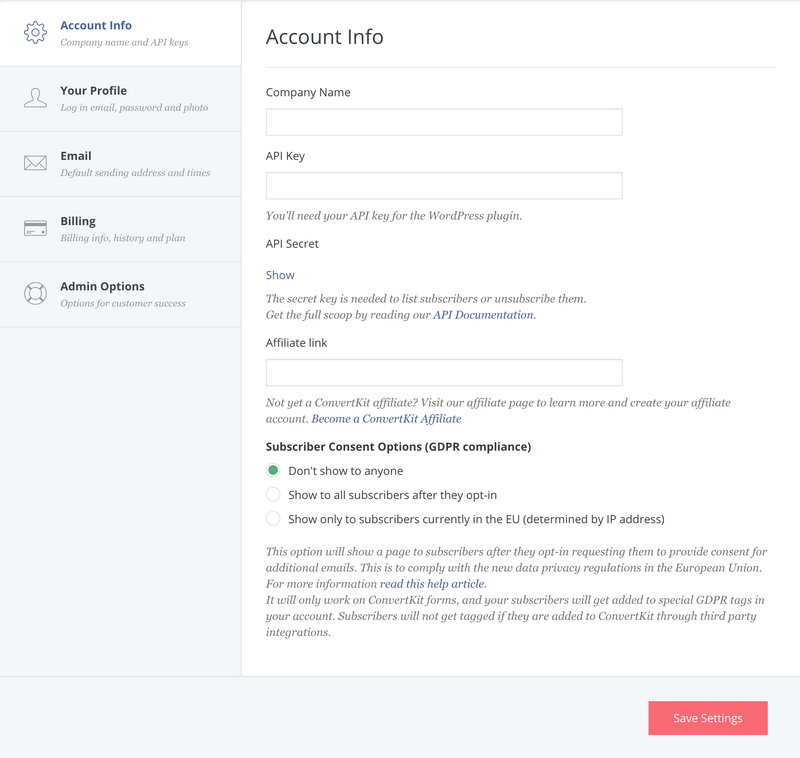 It will only work on ConvertKit Forms, and your Subscribers will get added to special GDPR Tags in your account. Subscribers will not get tagged if they are added to ConvertKit through third party integrations. Company Name: This is the email address you use to log into ConvertKit. Password: The password on your ConvertKit account. Gravatar: Your account photo will pull from Gravatar.com. Head there to update and customize your photo. From Name: This is the name that will show up in the Inbox when you send email. Reply-To Email: This is the email all your emails will be sent from, and all your replies will go to. Make sure this email address is one you own! Default Time to Send Emails: This is the default send time for Sequences. You can update this on a per Sequence basis, but this time set on this page will be the default. Your Plan: This is the plan you are currently subscribed to, and the monthly cost included. If you need to downgrade to a lower plan, please let us know! Card information: The card we have on file, that will be charged each month. Billing History: Pull up a history of your previous invoices and receipts.